In the fall of 1987, John Lugar and a friend moved a family to Florida during a college break for the adventure and $300. This trip led to the founding of Virginia Varsity Transfer based on becoming the “good guys” of the moving industry; clean-cut, professional and honest. Upon Lugar’s graduation in 1991, the company became a full-time operation. 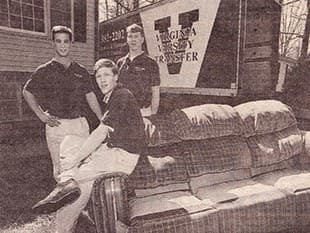 Throughout the next decade, Virginia Varsity acquired national licensing, grew its staff, expanded its fleet, built a headquarters - and developed an outstanding reputation. Today, Virginia Varsity operates numerous self storage facilities, employs a staff of approximately 50, and is headquartered in Salem, VA. The company has received many awards and widespread recognition for its customer service and ethical business practices. Virginia Varsity continues to reinvest heavily in training, equipment and professional development in the ongoing pursuit of delivering an ever-higher level of service to its customers. As a part of providing our customers with the very best service and industry knowledge, we actively participate in a number of state and national professional/industry organizations. We remain current on the changes in the moving and storage industries and observe best practices. Our customers are the beneficiaries to our commitment to continuous improvements. AMSA - American Moving & Storage Association - AMSA is the national trade association for the moving industry with a mission to represent the interest of the domestic and international moving and storage industry through effective advocacy and by building a respected, quality ProMover brand. ProMOVER - Virginia Varsity Transfer is a ProMover! VMWA - Virginia Movers & Warehouseman’s Association - VMWA exists to achieve the best possible operating environment for the users of moving services in Virginia. SSA - Self Storage Association - For more than 38 years the Self Storage Association has served as the official trade organization and voice of the U.S. and international self storage industry. VASSA - Virginia Self Storage Association - VASSA is a group of owners and operators organized to strengthen and enhance the self storage industry in the Commonwealth of Virginia. RVAR - Roanoke Valley Association of REALTORS - Virginia Varsity is an affiliate member of the RVAR and has a great relationship with the Roanoke Valley’s Realtors. Check out our reviews on Google, Yelp, Angie’s List, the Better Business Bureau, or ask your neighbor!